Can you believe that we are already in the 7th week of the school year? 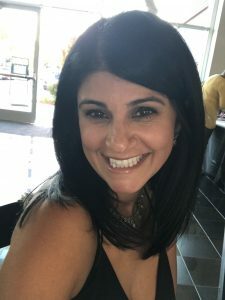 I am excited to serve as your PTA President again and one of my goals for us this year is to increase engagement with parents, teachers/staff and the overall Vinci Park community. One of the ways we will be doing that is by providing opportunities where we can meet other parents, teachers and staff. The first parent engagement event the PTA will be hosting is Pastries with Parents on Wednesday, October 3rd from 7:30-8:00 am in the multi-purpose room. 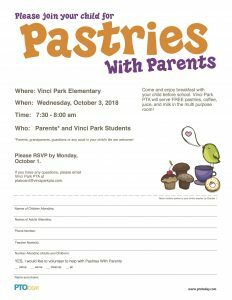 Please join us and enjoy breakfast with your child before they head off to class while getting to know other parents and staff at Vinci Park. 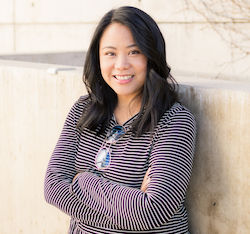 I hope I get to meet you at this FREE event hosted by the PTA! The second way we will increase engagement this year is through a survey we will be sending out to all PTA members. Your opinion matters and as a PTA member your feedback and input will guide the decisions made by the PTA executive board. If you are not a PTA member yet, you can always join by completing this membership form and attaching your $10 donation. Lastly, I want to encourage you to reach out to me if you have any suggestions, questions or concerns you would like to raise with the PTA. Please email me at president@vinciparkpta.com. My (virtual) office is always available to you! Our number one goal as a Parent Teacher Association is to advocate for each and every child at Vinci Park and to create an environment that will enrich the lives of our children. I am proud and honored to serve as your PTA President for a second year. It is hard to believe that we have already been in school for 7 weeks! Our students have come in ready to learn and we have settled into the daily routines. Please remember that you play a vital role in your child’s success at school. You can help by asking your child about his/her day, having a positive attitude about learning, and reading to or with your child every night. You would be amazed what 20 minutes of reading with your child each night will do her his/her language development and reading skills. Thank you for all your support at home! The accomplishments of Vinci Park Elementary School would not be possible without the tremendous support of our wonderful stakeholders. We reassure your partnership and know our success depends on teamwork. As always, we welcome your time and talents and look forward to a fantastic year! 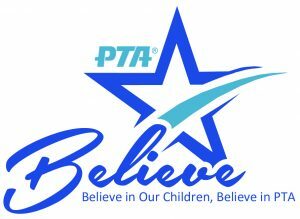 PTA stands for Parent Teacher Association and is a school-based organization with a mission to make the school a better place for our children to learn. Parents and students work together with teachers to volunteer in classes, raise money for school supplies, assemblies, field trips and more. Parents, teachers, grandparents and relatives who want to help. Joining PTA is a great way to support your school. Your membership helps support valuable enrichment programs that your school otherwise could not afford. You join with other parents to discuss key issues and concerns of importance to your school and community. You proudly affiliate with the California State and National PTA, the oldest, largest, and most powerful children’s advocacy organization in the country. If you would like to become a member, complete a form located at the sign-in desk outside the front office, attach your $10 contribution and submit it to your child’s teacher or front office staff. *A PTA membership does not require you to volunteer. We are currently seeking volunteers for our Fall Harvest Festival, Movie Nights and during our distribution day for our Otis Spunkmeyer fundraiser. We are also looking for photographers to take pictures at our events and graphic design artists to create flyers. If you have a special skill or talent that you would like to share, please contact us at ptaboard@vinciparkpta.com. We are asking for every family to volunteer for at least one event. If we don’t have enough volunteers to help at the events, the event won’t happen. Spirit wear will be sold on the last Thursday of every month between 7:45am-8:15am in front of room 14 (weather permitting). Our next sale is Thursday, October 25th. T-Shirts are $10 and hoodies are $20. Both children and adult sizes are available. We accept cash and checks made out to Vinci Park PTA. Spirit wear can also be purchased by completing a spirit wear order form in the office with your payment enclosed in an envelope. You will receive your order through your child’s teacher. We are in middle of our Otis Spunkmeyer cookie dough and Popcornopolis popcorn fundraiser. Brochures went home on September 25th. Please share them with family, friends and co-workers. Additional order forms can be found in the office. The due date to turn in order forms and money is October 9th. Please make sure checks are made payable to Vinci Park PTA. 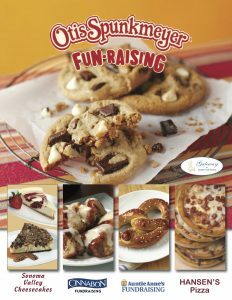 Click here for the online Otis Spunkmeyer and Popcornopolis brochures. Our kids are excited about the different prize levels they can achieve. The highest prize, a digital video camera, can be achieved by selling just 55 items. Every first Friday of the month each class will compete to see how many of its students can wear a Vinci Park t-shirt/hoodie or any blue clothing. The PTA will sponsor a prize to the winning class of the lower grades, TK-3rd, and the upper grades, 4th-5th grades. Congratulations to Mr. Torrez’s 3rd grade class and Ms. Perla’s 4th grade class who both had 21 of their students dress in Vinci Blue on September 7th. Our next Vinci Blue Friday will be October 5th. Vinci Park’s Running Club is every Monday and Wednesday morning from 7:20am-7:50am. Any student TK-5th can join after a signed permission slip is submitted to your teacher. The Running Club started on 10/1 and had a great turn out on it’s first day. Permission slips can be found at the sign-in desk outside the front office. Congratulations to Laura Torrez, Barb Dionicio, MaryGrace Tobias and Derrick Thompson who are the new elected members to Vinci Park’s School Site Council. The purpose of the School Site Council is to insure community participation in educational decision making. This year, all of the Berryessa Union School District schools are joining thousands of schools and communities worldwide on Oct. 10th for International Walk to School Day. Leave your car at home and walk to school. This event began in 1997 and over time, this event has become part of a movement for year-round safe routes to school and a celebration – with record breaking participation – each October. 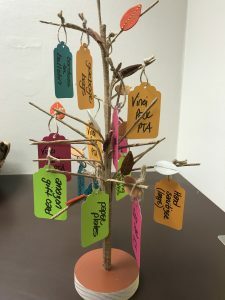 Our giving tree provides an opportunity to assist the PTA in purchasing the necessary items for our many events and programs. Items such as copy paper (white & color), card stock, paper plates, eating/serving utensils, napkins, garbage bags and more are used often and add to our expenses. Please consider taking a tag from our tree which is located in the front office. You many return the purchased item from your tag to the office. If you would like to help out, but are not at school often, email ptaboard@vinciparkpta.com and we can email you information about wishes that have not been selected yet or you can make a monetary donation. You have probably seen BOX TOPS on products you buy every day. DON’T THROW THESE AWAY. Vinci Park can turn these in and earn money for our school to use toward field trips, community events, and teacher support! It’s as easy as 1, 2, 3. Buy participating products with BOX TOPS on the package. Cut out the box tops along the dotted lines. Turn in the BOX TOPS to your teacher in a small baggie. For a list of participating products in the Box Top Program click here. Turn in the first round of Box Tops to your teacher by 10/19/2018. BUT—don’t stop collecting! The next submission will be later in the year. We created our first account on Instagram to help expand our communications. Find us under “vinciparkpta”. We will continue to post simultaneously on Facebook as well at “Vinci Park PTA”. It’s a great way to receive our announcements. Our next PTA Meeting will be held on Oct 11th at 7:15 am in the staff lounge. 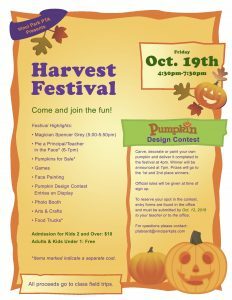 Festival highlights: Magician Spencer Grey (5-5:50pm), Games, Face Painting, Arts & Crafts, Pumpkin Patch, Photo Booth. All proceeds go to class field trips. *Volunteers are needed for overall set up, arts & crafts table, games, food & drink table, ticket booth, volunteer table, pumpkin patch and clean up. Contact ptaboard@vinciparkpta.com if you would like to help. Carve, decorate, or paint your own pumpkin and it will be on display during the festival. Prizes will go to the 1st and 2nd place winners. Winners will be chosen by ballot. Official rules will be given a time of sign up. To reserve your spot in the contest, entry forms are found in the office and must be submitted by Oct. 12, 2018 to your teacher or to the office. Click here to see contest rules.